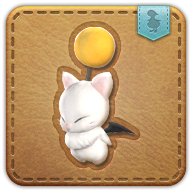 Summon your wind-up moogle minion. With its button nose and fluffy pom, this clockwork moogle will make you the envy of all your friends. A creation born of 90% love and 10% jealousy (or was that 90% jealousy and 10% love? ), this clockwork masterpiece was conceived after the moogles of the Black Shroud began noticing all the adventurers with their new shiny minions, and decided they were not about to be left out. Delivers an attack with a potency of 90 to all enemies within range.